Total time: Ready in 15 minutes. In a bowl, mix 1 cored and diced pear with 4 tsp Waitrose Apple & Walnut Chutney, 50g Waitrose Mild Grated Mozzarella and 25g shredded Waitrose Spinach For Cooking. Spoon the mixture over 2 tortillas and top each one with another tortilla. Place a non-stick frying pan over a high heat with a little olive oil, and put one of the tortilla sandwiches into the pan. Cook for 1-2 minutes on each side, pressing down with the back of a fish slice during cooking, until golden and crisp. 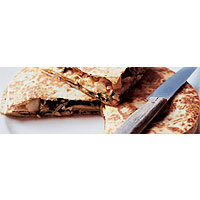 Keep warm in the oven while cooking the other tortilla. Cut into quarters, and serve with a tomato, red onion and basil salad.